In DeCook v. Rochester Int'l Airport Joint Zoning Bd., No. A09-96 (Mar. 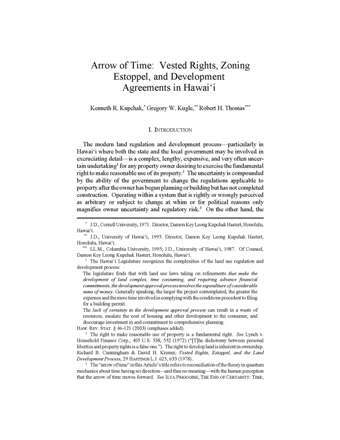 30, 2011), the Minnesota Supreme Court held that a $170,000 decrease in market value casued by an airport zoning ordinance was a compensable regulatory taking. Applying the Minnesota Constitution's takings clause, the court held that when a regulation designed to benefit a "specific public or governmental enterprise" causes a "substantial and measurable decline in market value," that compensation is due, even if it might not be a taking under the federal Penn Central test. On September 18, 2002, the Board enacted Ordinance No. 4, the ordinance at issue in this case. Ordinance No. 4 changed the land-use regulations within Safety Zone A so that fewer uses were allowed than previously permitted under Ordinance No. 3. For example, although Ordinance No. 4 continued to prohibit dwellings within Safety Zone A, it also prohibited all "buildings, temporary structures, exposed transmission lines, or other similar above-ground land use structural hazards." Permissible land uses within Safety Zone A under Ordinance No. 4 included "agriculture (seasonal crops)[,] horticulture, animal husbandry, raising of livestock, wildlife habitat, lighted outdoor recreation (non-spectator), cemeteries, and automobile parking," and those uses that "will not create, attract, or bring together an assembly of persons thereon." The Board also increased the size of Safety Zone A. For the DeCook property, that meant a total of 47 acres was within Safety Zone A as defined by Ordinance No. 4—the 19 acres previously located within Safety Zone A as defined by Ordinance No. 3 and an additional 28 acres. Slip op at 4-5. 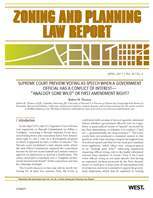 Relying on McShane v. City of Faribault, 292 N.W.2d 253 (Minn. 1980), the DeCooks asserted that application of Ordinance No. 4 to their land was a taking. In McShane, the Minnesota Supreme Court concluded that a runway safety zone regulation was a taking because "where land use regulations, such as the airport zoning ordinance here, are designed to benefit a specific public or governmental enterprise, there must be compensation to landowners whose property has suffered a substantial and measurable decline in market value as a result of the regulations." Id. at 258–59. The trial court dismissed the complaint, but the court of appeal reversed and remanded for trial. On remand, the jury found that Ordinance No. 4 diminished the value of the land by $170,000. Slip op. at 7. The trial judge, however, believed that the McShane test was not materially different from the test for ad hoc regulatory takings under the Fifth Amendment established by Penn Central Trans. Co. v. City of New York, 438 U.S. 104 (1978), and concluded that a $170,000 diminution in value could not be a taking as a matter of law. The trial judge conlcuded that the DeCooks did not meet any of the three Penn Central factors (economic impact of the regulation on the property owner, the regulation's interference with distinct investment-backed expectations, and the character of the government action), and focused on the economic impact factor to conclude that a $170,000 decrease in value was "minimal" when compared to the overall value of the land. The jury's finding resulted in a diminution of value of either 3.5% or 6.14%, depending upon whose appraiser's view of the land's valuation was accepted. Either way, it was not enough in the trial judge's view. The court of appeals reversed, and the Minnesota Supreme Court agreed to review the case. The issue before the court was whether a $170,000 reduction in value was a taking, and whether the McShane test or the Penn Central test controls. The court held that Penn Central is one of the tests for a taking, but not the only one when the state constitution's takings clause is being applied. The court held that the Minnesota Constitution provides property owners more rights than required by the Fifth Amendment, and there is a distinction between land use regulations that are part of a comprehensive plan, and those "enacted 'for the sole benefit of a government enterprise'" such as an airport. Slip op. at 12 (quoting McShane, 292 N.W.2d at 257-58). The court held that in the latter circumstance, compensation is due when the regulation causes a "substantial and measurable" diminution of the property's value. the $170,000 diminution in the value of the DeCook property caused by Ordinance No. 4 is substantial. Not only is there merit to the argument advanced by the DeCooks—that by any definition $170,000 in damages is substantial—it is also worth noting that the damages awarded by the jury exceeded the purchase price paid by the DeCooks for the entire 240-acre parcel less than 15 years before enactment of Ordinance No. 4, which caused the diminution in value suffered by the DeCooks. Because we conclude as a matter of law that the application of Safety Zone A to the DeCooks‘ property resulted in a substantial diminution in the value of the DeCooks‘ property, we hold that a regulatory taking occurred under the Minnesota Constitution. Slip op. at 16 (footnote omitted).